If you have read my complete guide on the benefits of amla oil for hair, you know that I am extremely fond of this fruit since 2012. I use it mainly to keep my hair long, thick, healthy and still very brown despite my 45 years old. I have also made it a habit to eat dried amla fruit in the morning, for its antioxidant, health and vitamin C benefits. Amla, therefore, has benefits for hair, health and skin and in this article, I will talk more specifically about amla benefits for skin. For advice on the use of amla oil for hair and beards, feel free to read or reread my complete guide here. 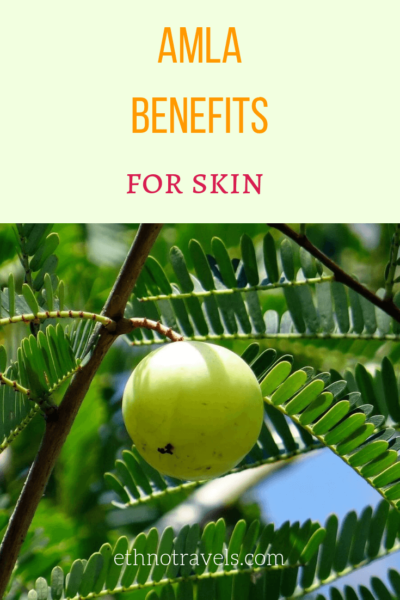 You should read this article if you want to know more about the role of amla in Ayurveda, its benefits for the skin and what type of amla to use. This is pure amla oil for skin. The place of amla in Ayurveda. What are amla benefits for skin? 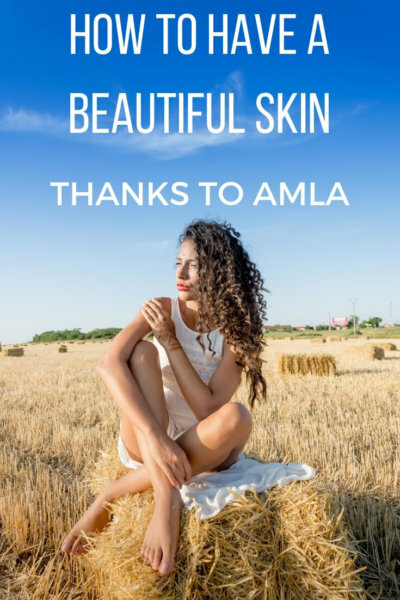 Which amla products to use for its benefits for skin? Pure amla oil for skin. Amla powder benefits for skin. How to prepare an exfoliating and antioxidant facial mask with amla powder? How to prepare an infusion with amla powder? How to use Amla juice for skin beauty? Ayurveda is a traditional medicine originally from India. The word comes from “āyus”: life and “veda”: science, knowledge. Ayurveda therefore derives from the Veda, the sacred texts of ancient India. It aims to achieve three goals: maintaining health, curing illness and self-realization. To do this, it is essentially using the natural power of plants. The amla is considered a sacred fruit in India. In Ayurveda, it is compared to the mother who gives everything to her baby. It balances the 3 doshas, the vital energies responsible for the proper balance of body and mind, and is used in many Ayurvedic preparations. * reduce the appearance of scars, imperfections, age spots and wrinkles. Amla is also rich in vitamin C, which is essential for skin regeneration and elasticity. It removes toxins and acts as an antioxidant. For the skin, you can use pure amla oil, serum, amla powder, amla juice and dried fruit. This pure, unrefined and non-GMO oil can be used both for hair and skin care. This bio serum combines different kind of natural products with Amla for maximising the benefits for skin. Mix the liquid of your choice (honey for spots, yoghurt for its lactic acids and probiotic effects or rose water for the complexion) with the powder. Apply the mask to the face. Keep it 10-30 minutes (be careful the first time and don’t keep it more than 10 minutes). It’s easy: mix the powder with hot water and add honey. 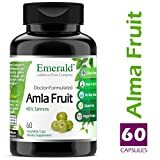 The amla juice is very bitter and must be diluted a lot. Drink a glass every morning for a few days. Eat some dried fruit in the morning on an empty stomach. You can mix them with other fruit juices. Have you ever tested the amla benefits for skin? For more reviews, visit the reviews section here.